Despite many doubts about the reliability of the polls, this time there were no sensational surprises in the presidential elections held on the 31st of March in Ukraine. Now that all the votes have been counted by the Electoral Commission , comedian Volodymyr Zelensky is leading the race with 30.2% of the votes – almost twice as many as the second candidate, outgoing president Petro Poroshenko, who got 15.95%. 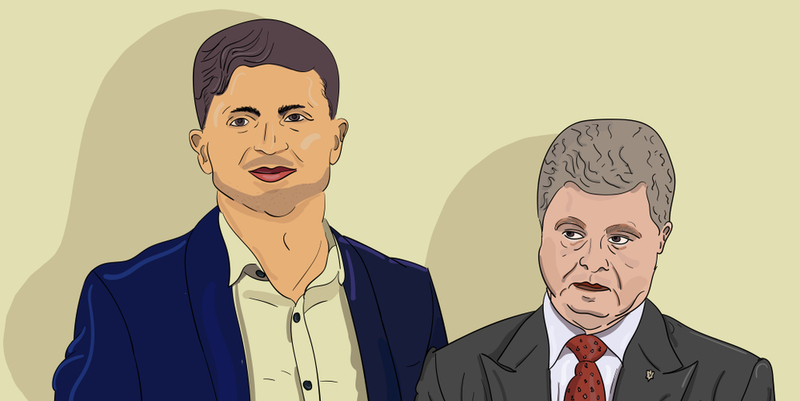 Zelensky and Poroshenko are the provisional winners of the first round and will compete in the second round of April 21st. Zelensky, despite (or thanks to) the lack of experience in politics and a vague electoral programme that we could define as populist, has managed to capitalise on the growing dissatisfaction of the electorate for the precarious economic situation, the lack of effective reforms of the system, and the growing corruption in the upper echelons of politics which directly and indirectly involves also the outgoing president. Yulia Tymoshenko, the passionaria of the orange revolution and political prisoner during the Yanukovych regime, was defeated for the umpteenth and perhaps the last time. After leading the polls for a large part of the electoral race, she obtained only the 13.4% of votes and was overrun by Zelensky. A very alliance between the comic and the passionaria in view of the second round has been rumored for days now. Tymoshenko, however, denied such rumors and stressed during a press conference that she does not intend to support any candidate. Yet, given the nature of the campaign and Tymoshenko's electorate, it is hard to believe that her votes could go to flesh out support for Petro Poroshenko. After the defeat, Tymoshenko chose her new path carefully – a road that leads directly to the parliamentary elections scheduled for the end of October. Defeat met also Yuri Boyko, the candidate commonly associated with the Kremlin. Despite winning in many districts in Donetsk and Lugansk (i.e. the part of the two regions that remains under the control of Kiev authorities), Boyko obtained 11.6% of the votes – not enough to concern the pair in the lead, but a result that is not altogether negative for a candidate who had just flown to Moscow for a consultation a few days before the vote with Russian premier Medvedev. What does the first round tell us? Even if we are only halfway through the race, the first round offers plenty of food for thought. The first point concerns the regularity of the vote. Despite an electoral campaign characterised, especially in its final part, by numerous irregularities and attempts at corruption of the electorate, mainly by Poroshenko and Tymoshenko , Sunday's vote took place in a transparent manner, at least by the standards of the post-Soviet space. This is confirmed not only by the preliminary reports of international organisations (OSCE on all), but also by some analyses that look at the progress of the vote from a statistical point of view. Yes, there were some issues and doubts remain about the particularly high turnout in the Donetsk and Lugansk regions. All in all, however, the incidence of these facts on the final result seems to have been minimal. This is also confirmed by the behaviour of Yulia Tymoshenko who, after a first attempt to raise the tones by claiming she was victim of a fraud, then refrained from calling her voters to protest, accepting the defeat. Second and most important, the first round seems to confirm some trends that had already emerged in 2014, when the situation was however much more tense, with the very existence of the country seemingly under threat. The rift between the Ukrainian-speaking electorate and the Russian-speaking one, which has historically characterised Ukrainian politics, seems to have had less incidence than in the recent past. This is probably due to the candidacy of Zelensky who, as the results show, with his anti-establishment rhetoric managed to attract consensus both in the west and in the east. If it is true that support for the winner of the first round is stronger in the south-east, it is equally important to note how he managed to win even in the majority of the western regions of the country, regarded as strongholds of Poroshenko and Tymoshenko. Although this probably does not signify the ultimate disappearance of the regional division between east and west of the country, the electoral map seems less polarised in terms of the old dichotomy between orange (pro-European) and blue (pro-Russian). The new dividing line is now represented by age. Support for Zelensky is strong in the younger electorate, while older voters remain loyal to Poroshenko. Zelensky's primacy is therefore not only the demonstration that the idea of ​​a mono-cultural and mono-lingual country, strongly promoted by Poroshenko in recent years, has not taken root, but also of the failure of the divisive electoral campaign conducted by the outgoing president. In fact Poroshenko, with his motto "Language, Faith, Army", presented himself as the defender of Ukrainity and as the only pro-European candidate, casting all the others as puppets of Putin and the Kremlin. He maintained this strategy even when the result of the first round had become clear in the hours following the vote, with its loyal supporters and 'journalists' (not only in Ukraine!) pouring mud on Zelensky's voters on television and on social media . What to expect from the second round? The two weeks that separate us from the second round could certainly hold surprises. Yet, Zelensky, allegedly backed by powerful oligarch Igor Kolomoisky, seems to be the big favourite, partly for a purely historical-statistical element – as many election scholars state, when the outgoing candidate loses the first round with about half of the winner's votes, the chances of overturning the result in the second round are generally almost nil . In Ukraine, moreover, as a demonstration of great electoral volatility, only one president – Leonid Kuchma – ever managed to get himself re-elected for a second term (1994 and 1999). Even the current political situation does not seem to be playing in favour of the outgoing president. Poroshenko is the candidate with the highest anti-rating (manifestations of a hypothetical vote against) among the main protagonists of the electoral campaign – a factor that seems difficult to change in a few days, also considering the anti-establishment image that Zelensky has built for himself. Finally, even the polarising, divisive rhetoric adopted by Poroshenko seems to play again in favour of Zelensky. Despite attempts to present the opponent as Putin's candidate, Zelensky is not perceived as such by the majority of the electorate – simply because he is not. Despite his non-transparent links with oligarchs, populist rhetoric, and vague electoral campaign, the comedian seems to be able to continue riding the general discontent with Petro Poroshenko, attracting – with or without formal agreements – also the electorate of Yulia Tymoshenko. What seemed like a joke a few months ago could become reality come April 21st. A comedian at the helm of a country that remains imprisoned in its contradictions, with part of the territory occupied by Russia and a conflict that still seems to have no solution. Only time will tell us if Zelensky represents a real novelty, or just another episode in the ten-year war between the powers that be, oligarchs, and external pressures.